The day after university finished, two friends and I rented a car and set out on a journey that would take us on a 2000 kilometer loop of Syria eastwards and then back down to Damascus from the coast. I was nominated to negotiate the traffic of Damascus on the first day and I must say that compared to India it is fairly civilised, obviously not taking into account clinically insane servees drivers. Nono, an Estonian-American, had not been to Palmyra before, unlike Freddy and I, and so he wandered through the ruins. Early morning panorama of Palmyra. We ate a quick lunch of Roasted Chicken with salad and hommous and then set off for Deir ez-Zor. The road was virtually empty apart from the odd truck and the landscape was monotonous with a rocky desert sprawling into the horizon. After a while I noticed that the wheel was shaking and so I pulled in to the hard shoulder and sure enough the front tire had developed been lacerated and was bubbling in places. Thankfully in India, when one learns driving, one also rapidly learns how to change a tire and so I set about putting the jack in place. However the bolts on the tire wouldn’t budge! After a while Freddy hailed down some men on a motorcycle. They stopped and the passenger decided to wander off into the desert while the rider, wearing a red keffiyeh and a leather jacket, walked up and without uttering a word started loosening the bolts. A young boy stood there and whispered hello to us but other than that remained silent. As soon as the tire was changed he got up, dusted of his trousers, got on his bike and drive into the desert to pick up his companion. Unfortunately, we could only drive at a maximum of 80 km/h on the spare and when I spotted a stack of tires on the road I stopped to see if ours could be fixed. There were no men in sight but then a burly looking woman, in a purple velvet robe and a green hijab, shouted ‘Ghazi’ and suddenly five men appeared from the back. They all took turns to scrutinise the tire and then pronounced that it was unfixable and we would need to buy a new one in Deir ez-Zor. They then invited us to tea and offered us chairs but we preferred to sit on the carpet on the floor. By this time I had noticed that they spoke in an Iraqi accent and so asked them where they were from. It transpired that they were refugees from Mosul in Iraq. However, they refused to believe I was Indian and every so often Ghazi, the oldest man, would smile beamingly from under his walrus moustache and ask me: ‘really, where are you from? Tell me truly.’ The tea came and was very light so Ghazi told them to take it back and then explained to everyone that if I was Indian then I would not drink a light brew. He then apologised that he did not have any milk to go with the tea. We took a quick group photo and all congregated near the olive trees as Ghazi wanted and then set off. He gave us his telephone and asked me to call him if there were any problems further along the road. We reached Deir ez-Zur by nightfall. The town was falling asleep and shopkeepers were slowly cranking down their shutters. The main souk is near the canal, which in turn runs parallel to the Euphrates. The roof of the souk is triangular and not rounded like in other cities. Alongside the canal, on the Corniche, young people were loitering about, couples stood in corners where the ghoulish orange light from the streetlamps couldn’t reach them and mothers with young children struggled to control their herds. We found a small hotel opposite the main souk. Inside the reception, an old man was pouring himself coffee, smoking and was watching a Raj Kapoor film. Suddenly he looked at his watch and switched the channel to Sayyid Hasan Nasrallah’s speech regarding the arrest of Hizbollah men in Egypt, but then he switched back to the Indian film after spending a fidgety few minutes watching the address. The hotel was lifeless, with the cheap white tiles reflecting the nauseating white tube lights. It looked like it had been a hospital or some sort of insane asylum in a past life. Someone had recommended a restaurant on the bank of the Euphrates so we trekked out in search of the French suspension bridge. The whole town had come close to being relocated when people thought that there were vast oil reserves underneath it but then fortunately it turned out that the reserves were quiet limited. We walked across the bridge and went towards the small clearing on the opposite bank. The restaurant was more like an outdoor café and there were tin sheds everywhere. We walked down towards the banks and sat down. Most of the other customers were either groups of shabab or giggling hijabi girls being courted by eager young men! The workers were all Kurdish and once and a while we could catch a snippet of their conversations. Pharsi seems to have had a strong influence on Kurdish. I sat down and even though I could not see the river, I could hear the hushed sound of water as each wave gently pushed the other forward. There was something distinctly melancholic about the place. I am not sure whether it was the worried looking Kurds, the neon lights, the river or the broken and tragic voice of Om Koulthoum coming out from the cheap speakers. Maybe it was a combination of all of them. Earlier I was telling Freddy and Niko that it was particularly poignant for me to see this river that I had heard and read so much about because it was this very same river that had flown through the plains of Karbala fourteen hundred years ago. The next morning we went to buy a tire and then had a filling breakfast of Phool, bread and tea. I knew I had forgotten something when I left and as I took the first sip of my brown sugar syrup, I thought of Earl Grey sitting on my breakfast table in Damascus. The previous night we had not really been able to see the suspension bridge and so we drove back to see it. On the way a man with a rifle stopped us saying that the road was one way but soon afterwards his superior, with a worried face and a crumpled suit came up and asked us where we were from and then allowed us to continue, waving us through with a friendly ‘Allah Ma’ak,’ God be with you! There was nothing particularly eye catching about the bridge. A few weary looking photographers with their antique looking Yashica cameras loitered about near the entrance and stopped staring at us as soon as they saw our digital cameras. After a few touristy shots that we will probably never look at again, we set off towards Mari, downstream on the Euphrates in the far eastern corner of Syria. It is funny how on the one hand technology has made our lives so much easier yet because of the ease and inexhaustible supply of gadgets we no longer value things and in fact we often verge on irreverence. Taking a photograph is a good example of this. I remember when I was a child, how we used to be in awe of my mother’s old, clunky Minolta camera, how every shot was carefully thought out because there were only 36 shots on the film and obviously the excitement about going to the photographer and having films developed. I met a wonderful Canadian photographer, Jonathan Luckhurst, in Yemen who still uses film and it seemed that he really had to learn his art rather than just downloading photos onto Adobe and tinkering with them until reaching the desired effect. The road was surprisingly well signposted and we whizzed past blue boards that declared Iraq was only a hundred kilometers away. Niko interrupted Frank Sinatra to proclaim that if we were caught by wayward fedayeen who had popped across the border to find some foreigners, he would claim that he was a Chechen or Bosnian Muslim and if they pulled down his pants to inspect him, he would say that he was afraid of the knife! Needless to say the conversation did not continue for very long and we went back to listening to ‘Mack the Knife as we sped down the road. We could not see the Euphrates but on the other side, towards the south, I could make out the rugged outline of red cliffs. The villages were nearly all made of dull concrete dusty, though the green fields added a welcome bit of colour. People wore traditional dress. I saw more red keffiyehs than I have ever seen in Damascus and instead of the black hijab, the women wore long colourful robes with scarves wrapped like bandanas on their heads. The cliffs I had seen in the distance had undulated their way towards us and we suddenly came to a sharp climb, leaving the green fields behind. As we reached the top of the plateau, I managed to see the other side, which was a frightening expanse of sand interspersed with the odd electric pylon. We stopped, wondering if we had gone to far and missed Deir Europos. As I turned to look at the plains below us, a cluster of palm trees and a scraggly looking wall caught my eye. We drove towards the remains of what was built as a Macedonian military colony in the 3rd century BC. Over time it passed through several hands and was eventually abandoned and desereted after Shapur I of Persia conquered it in 256. The breadth of diversity of religious buildings is astounding with monuments from Palmyrene, Persian, Semitic, Jewish, Christian and ancient Greek religions, which, are all ruins now and ostensibly, are no longer different from one another. However, it was amusing to see that the synagogue was in better condition than the other buildings because it was built on the outskirts of the town near the ramparts and ironically it was this exclusion that preserved it. I walked in past the massive walls facing the desert and into the vast expanse of ruins inside. We headed towards the back of the site where the citadel is built. The town was built on a plateau, protected on one side by the Euphrates, on the others by deep gorges and the entrance overlooked the desert. 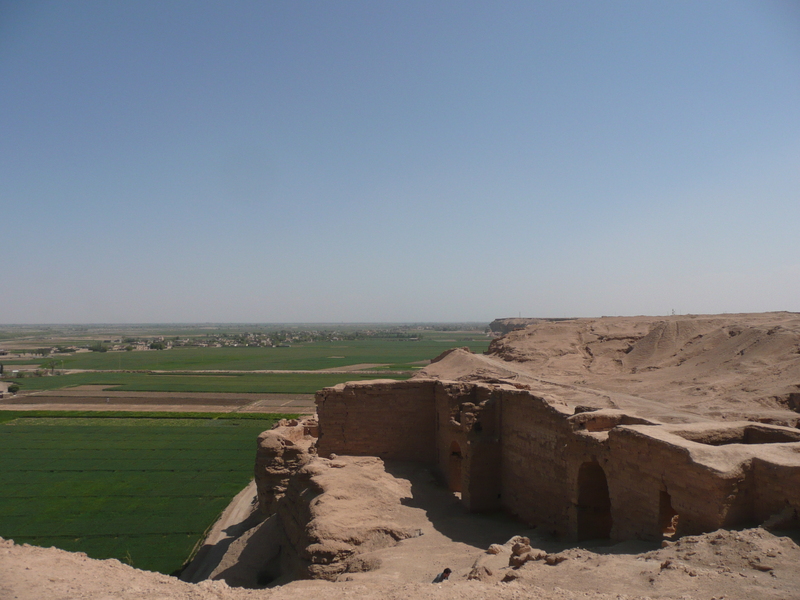 The view from the top of the remains of the citadel was magnificent with the sandy and rusty red ruins behind me, a clear blue sky dipping into the horizon and the dazzling green fields beneath me, next to the sparkling waters of the Euphrates. Women in colourful floral dresses were working in the fields hunched over while hoards of children were trying to scramble up the sides of the cliff. Niko joined me and after sitting in silence for a while, ponderously wondered if New York would one day be like this, and then disappeared into the warren of rooms below us. Some Syrian Shabab had wandered into the ruins and before they had a chance to start playing music on their mobiles or begin an impromptu debka session we left. I waved to the man who sold us the tickets earlier. He thought that I was Freddy and Niko’s guide and so only charged me a fraction of the actual cost of the ticket. We drove further along on the same road until we came to the ruins of Mari. Even though the ruins are not as visually arresting as Deir Europos, it is incredible to even start thinking about how the Sumerian settlement in front of us dated back to the fourth millennium BC. Mari was occupied and flourished in the Early Dynastic period and then changed hands from Akkadian to Amorite rulers. According to historians this was the period of greatest prosperity and it was under an Amorite ruler that Mari became famous for its lavishness and luxury. King Zimri Lim, who I fancy may have been a forbear of Kim Jong Il’s, built a vast pleasure palace that was so famous that the Lord of Ugarit wanted to visit it. 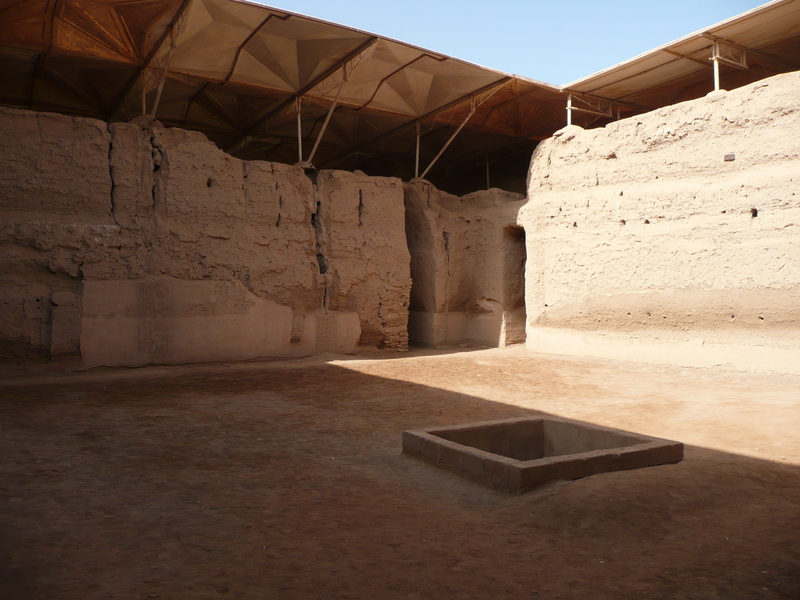 Hammurabi of Babylon destroyed Mari thus making Babylon the center of civilisation but some parts of the palace still survive and it is possible to walk into the remains of the palace that dates from the second millennium BC. The site is protected and supported by girders and steel pillars and from above it is sheltered by huge plastic roof. However, I could not help but wonder how long we would manage to preserve the mud building until it disappears permanently. As I walked back to the car, I reeled from the thought that we had just walked beneath four to five thousand year old ramparts. As we were leaving a huge group of Germans had arrived, seated themselves in one of the open-air tents and were gorging themselves on tinned meat, olives and salad. The ticket vendor waved goodbye to us; he too had thought I was a Syrian guide and it was only when I insisted that I was Indian did he enter my name on his logbook. Thank you Ali for your lovely trip report. I didn’t know about this ancient synagogue, and those special fresco’s.